Reprinted with permission from Houghton Mifflin Harcourt. Copyright (c) 2011 by Ian O' Connor. Brian Cashman had a more pressing on-field problem with a player who was not among George Mitchell's traveling all-stars: Derek Jeter. His defense was hurting the Yankees, and Cashman decided to do something about it. Jeter had made his eighth All-Star team, had won his second straight Silver Slugger award, and had become the first major league shortstop ever to collect six 200-hit seasons. But the sabermetric police had hauled in Jeter again, charging him with a number of fielding felonies. John Dewan of The Fielding Bible slapped Jeter with another minus 34 in 2007 (he made 34 fewer plays than the average shortstop), and the captain's score from 2005 through 2007 added up to a leagueworst minus 90 (Houston's Adam Everett led baseball over the same period at plus 92). Jeter's 2007 Ultimate Zone Rating, according to FanGraphs.com, checked in at minus 17.9, meaning his defense cost the Yanks 17.9 runs the average shortstop would have saved. Not that Cashman discovered Jeter's defensive deficiencies in any statistical chart; his eyes told him the shortstop hadn't lost one step, but two. So he invited Jeter to dinner and met him in an Upper East Side restaurant. The captain had no idea he was scheduled to be the main course. In Jeter, Cashman knew he had the near-perfect player. Near-perfect in the way he carried himself, in the way he competed, in the way he won, in the way he respected his elders and embraced his role-model responsibilities to the kids. The kids. Jeter was always great with the kids, regardless of the circumstances. One day after he had retired from baseball, Chad Curtis, the old Jeter antagonist, showed up at Comerica Park in Detroit with twenty-five students from NorthPointe Christian High School, where the former Yankee outfielder worked. Wearing shorts and a backpack and looking like he was ready to climb Mount Everest, Curtis made his way to the field and over to Jeter while the shortstop was doing his pregame stretching. Five minutes later, Jeter was near the stands and shaking hands with every single one of Curtis's twenty-five students. "If you had a daughter, you'd want her to marry Derek Jeter," Cashman said. "He's a great person." Jeter could be overly sensitive to criticism, and Cashman had that figured out going into this dinner. Some who knew the shortstop suspected this weakness was rooted in the racism he faced in his youth, and to the fact that his African-American father and Irish-American mother shielded their son and daughter from the ignorance of others by wrapping them in a warm blanket of nurturing and love. Others felt Jeter was overly sensitive to criticism for the simple reason he was so damn good at everything he did, he wasn't used to receiving it. And those who did criticize the shortstop could feel the sting of Jeter's River Avenue freeze-out. "One of Derek's standards," said longtime New York Post baseball columnist Joel Sherman, referring to club personnel and not journalists, "is if you burn me once you'll live outside my igloo forever, and if you freeze to death that's your problem." One teammate who was friendly with Jeter recalled mocking the shortstop -- in a joking way -- in front of a small group of Yankees. Jeter glared at the teammate, turned away, and ignored him for two weeks. "I didn't understand it, because we'd kidded each other all the time," the teammate said. "But then I realized: that was the first time I did it in front of teammates, and as the captain he didn't appreciate having that done in front of others." Nor did Jeter appreciate less than glowing critiques from any corner of his athletic past. Told one of his former youth summer basketball coaches recalled he had likely been dunked on more than anyone in the state of Michigan -- if only because Jeter hustled so much to get back on opposing fast breaks -- the shortstop said, "I don't know about getting dunked on. Power lay-ups, maybe." Jeter had a long memory, too. In 2001, teammate David Justice was talking with Newsday baseball columnist Ken Davidoff when the writer mentioned he was the sports editor of the University of Michigan school paper who had assigned a piece on Jeter to another writer when the shortstop enrolled there in the fall of '92. Justice yelled over to Jeter, "Hey, Jeet, this guy wrote about you at Michigan." Expressionless, Jeter replied, "The story said I played football. I didn't play football." Yes, Jeter had a low tolerance for real or imagined slights. He rarely deviated from his one-strike-and-you're-out policy, as his old friend from his days as a minor leaguer in Greensboro, Earl Clary, could attest. Clary adored Jeter and opened up his home to him, but recalled their relationship changing over a chance meeting in a Baltimore restaurant. Clary was entertaining a customer when they stumbled upon Jeter sitting with some Yankees at a table. The customer grabbed two bags of souvenirs and rushed over to the shortstop to have him autograph each item. "I'd never asked for anything from Jeter, but it was my fault; I should've told the jackass not to do that," Clary said. "I can't express what a great guy Jeter is, but he used to call me back right away and it was never the same after that night. He was cool to me after that night." Jeter could be cool and distant and suspicious. "If you knock on his door," said the YES Network's Michael Kay, "he'll talk to you for four or five hours through the screen, but you'll never get invited in." Jeter's buddy R. D. Long was among the precious few who had been welcomed inside the screen door. But getting inside did not mean full trust was offered without careful inspection. "Fame and fortune can make you very paranoid," Long said, "to where I have the sense he's unsure what my intentions are as his friend sometimes, and that bothers me. ... Derek's always feeling, 'Somebody may be taking advantage of me.' "
The founder of a nonprofit college prep program for student athletes in the Rochester, New York, area called Mind, Body & Soul, Long invited his former minor league teammate to his wedding in 2004. "Derek flew in on a Thursday night and flew out on a Sunday night and stayed the whole time for my wedding, all aspects of it, like a normal person," Long said. "He bought eleven suits, $2,000 apiece, for my groomsmen and the fathers, from Michael Jordan's tailor in Chicago. "Instead of those suits, he could've written a $22,000 check to me for my program, but he's not going to do that. He doesn't know exactly where the money's going. It comes with the territory." Long said he still loved Jeter the way he would a kid brother, still saw him as a man with almost no character flaws. But even as he looked at Jeter's world from the inside out, Long understood the shortstop often lived behind impenetrable walls. "Derek," he said, "is the iciest non-icy person I've ever met." So when Brian Cashman sat down with Derek Jeter to tell him he needed to improve his lateral movement on defense if he wanted to remain at shortstop, the GM knew he would be standing outside of Jeter's locked screen door at the start of their dinner, and quite possibly freezing outside of Jeter's igloo at the end of it. Cashman had little choice but to play the bad guy here. He could not ask Girardi to confront his former teammate in his first significant act as manager, even if Girardi had already confided in friends that Torre's successor ultimately would be the man to tell Jeter he would have to change positions. The GM could not risk destroying the manager-captain relationship before it ever had a chance. Besides, Cashman had held a few conversations with Torre about moving Jeter to center field as far back as 2005, when the Yankees were dissatisfied with the aging Bernie Williams and Tony Womack. Torre told Cashman he would run the idea past Jeter, who was so reliable on pop flies the Yanks believed he could make a Robin Yount -- like transition to center. 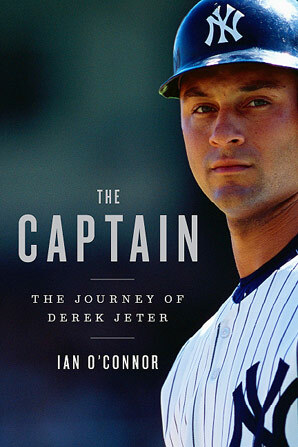 When the GM later asked Torre what had come of his talk with Jeter, the manager said the captain wanted to stay put. So as dinner began, Cashman reminded Jeter that Torre had spoken with him about a move to center. Only Jeter swore he'd had no such discussion with Torre. In fact, despite Torre's claim to Cashman that he had spoken with the shortstop about improving his range, Jeter maintained his manager never once mentioned that his defense was an issue. Cashman nearly fell face first into his soup. He could not believe what he was hearing. Was it possible Derek Jeter had become so big and so iconic that a fellow icon and four-time champ and future Hall of Famer and living New York institution such as Joe Torre was afraid to coach him? Jeter said Larry Bowa did tell him to shade toward third base, as if to cover for Alex Rodriguez, but that no other coach suggested he needed to improve his own play. Cashman countered that A-Rod was playing at a Gold Glove level, and that if there was a weakness on the left side of the Yankee infield, it was not at third base. The stunned shortstop and the stunned GM were at a stalemate. The relationship between employer and employee could have detonated on the spot. Cashman knew there were coaches who did not want to risk their standing with a superstar player by criticizing him. Jeter, a three-time Gold Glover, knew the Yankees were now suggesting his defense was among the reasons the team had not won a title in recent seasons. Man, it had been a long year, and it had nothing to do with the fact that New York tax officials were maintaining that Jeter owed them three years' worth of unpaid taxes as a state resident. (The shortstop claimed he was a Florida resident who kept an apartment in the city, and the case was ultimately settled.) The sabermetric crowd was buzzing about this declining range factor and that declining zone rating, Gary Sheffield had hurt him in an HBO interview by saying the biracial Jeter "ain't all the way black," the Yankees had lost again in the first round, and Torre had left for L.A. This dinner could have turned into the ugliest of food fights, yet Cashman could not turn back. He had been taught by Gene Michael to speak his mind, with feeling, just as he did as an assistant GM in the spring of 1996, when he voted to keep the rookie Jeter in the starting lineup. Right here, right now, Cashman would show his own extreme talent as an executive. He would show why he helped the Yankees win multiple championships. He would make a critical stand nobody else in the organization had the nerve to make. It was up to the captain to decide how this game would end. And on this night, with the Yankees telling him for the first time his best was not good enough, Derek Jeter rose above his human frailty, above his allergic reaction to criticism, and put his beating champion's heart right on the table. "You mean to tell me we were trying to win a championship every year," Jeter told Cashman, "and there was a way for me to get better to help us do that, and nobody told me? "I'm only going to play for so many years, and if you're telling me there are things I can do to make us better and put us in a better position to win, why wouldn't someone tell me this? . . . I want to do everything I can to get better. It makes me wonder how good we could've been and how many more championships we might've won if I'd dealt with this." It was the perfect response. It was the winning response. It was Jeter revealing the essence of his greatness. The captain was not angry at Torre; he could not get angry with the manager who had meant so much to him. "I was with him since I was twenty-one years old and I pretty much grew up with him," Jeter said. But the shortstop was incredulous that the manager and those on his staff never mentioned that he needed to work on his defense. As it turned out, Jeter was more coachable than his bosses had given him credit for. "I don't think you should have a problem with trying to get better," Jeter would say of his dinner meeting with Cashman. Asked if he was completely on board with the GM's suggestion that he needed to improve defensively, Jeter said, "Why wouldn't I be? It's important to get better and to be willing to listen." Yes, the ultimate team player was going to take one for the team. The Yankees had a new fitness trainer in mind, one recommended by Jeter's agent, Casey Close. The Yanks thought the trainer might make a thirty-three-year-old ballplayer a more explosive lateral force, and the shortstop agreed to give it a shot. The general manager and the captain shook hands. In the middle of a Manhattan restaurant, even if Derek Jeter did not realize it, the prince of the city was reborn.